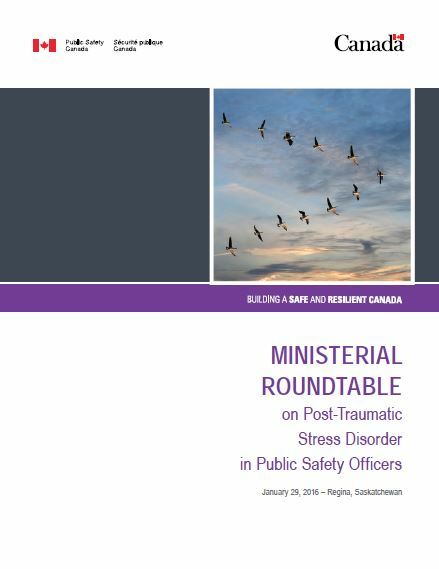 Public Safety Canada hosted a Ministerial Roundtable on January 29, 2016 at the University of Regina on the impacts of post-traumatic stress disorder (PTSD) on public safety officers. The roundtable brought together over 50 members of academia, not-for-profit organizations, union representatives and tri-service leadership (fire, police and paramedic), operational public safety officers, and all three levels of government to the table to discuss the threat posed by operational stress injuries (OSIs) affecting public safety officers. Tri-services representatives opened the roundtable by defining the problem in the context of their respective organizations, and examining potential ways to address it, such as developing evidence-based national standards for the assessment, treatment, and long-term care of public safety personnel suffering from PTSD, and other operational stress injuries. Public safety officers is a broad term that is meant to encompass front-line personnel who ensure the safety and security of Canadians, including tri-services (fire, police and paramedics), search and rescue personnel, correctional services officers, border services officers, operational intelligence personnel and indigenous emergency managers. PTSD can be experienced by members of the general public; however, it is most commonly associated with armed forces and public safety officers. The Minister of Public Safety's mandate letter features a commitment to work with provinces and territories, and the Minister of Health, to develop a coordinated national action plan on PTSD, which disproportionately affects public safety officers. Public Safety Canada is uniquely positioned to provide national leadership on this initiative, given the Department's broad mandate, Portfolio partners, and established relationships with both the tri-services and Federal/Provincial/Territorial governments. Presentations were given from members of the tri-services. Each association provided insight on issues related to PTSD in their respective organizations, and what they believe could be done to address these issues. No standardized prevention or mitigation tool to offset impact of operational stress injuries. Academia presented on what can be done to address PTSD among public safety officers. It was underlined that there is a strong need for sustained research to underpin innovative treatment options such as internet-based cognitive behavioral therapy. Key takeaways can be divided into three broad areas that will inform the development of a national action plan: the need to create a unified, grass-roots approach to both defining and identifying PTSD; the importance of resilience, treatment and reintegration into the workplace for public safety officers; and, the need for national, coordinated research. The public safety officer community includes federal, provincial and local employees. Federally, this encompasses a diverse community such as border services personnel, correctional services officers, operational and intelligence officers and the Royal Canadian Mounted Police. In addition, police, fire and paramedic services fall under the jurisdiction of local or provincial governments. Given the numerous organizations that exist, with varying structures and culture, we heard that within the public safety officer community itself, availability of treatment, presumption of illness and workplace culture varies widely. In addition, there is a big difference between the more structured support available to armed forces and veterans and that which is available to public safety officers. Many participants expressed the need for a unified, collaborative approach for dealing with PTSD across the country. There was clear consensus at the table that public safety officers must be treated distinctly from our armed forces. While the biological underpinning of operational stress injuries may be similar when comparing armed forces members to public safety officers, barriers to treatment can include stigma and in-organization culture. In addition, public safety officers operate in the communities where they live and are often repeatedly exposed to potentially traumatic events. It was believed that a unified approach could be one way to help address stigma, which was cited by many as a significant barrier. The culture of stigma within public safety organizations hinders the ability to accurately track and monitor the rates of PTSD within organizations. In addition, many participants vocally supported the desire to switch away from the term PTSD, which is believed to contribute to the negative stigma, towards a more inclusive term of operational stress injuries (OSIs). Many tri-services, including operational members, expressed that cultural change is best achieved through initiatives that tackle the issue both at the operational and senior management levels, and indicated the need for a strong stakeholder engagement commitment. Participants were supportive of the Government approach to develop a coordinated, national action plan on PTSD. When speaking specifically to PTSD in public safety officers, tri-services expressed that attention needs to be focused on three key areas: resilience, treatment and reintegration. First, resilience speaks to the need to build PTSD and other OSIs into the everyday dialogue of public safety organizations by ensuring public safety officers have the tools to recognize early symptoms, know coping mechanisms and when to seek professional support. This could include things like stigma reduction through educational campaigns or access to evidence-based training tools. Second, tri-services expressed a desire to see innovative, flexible and accessible evidenced-based treatment options. Challenges mentioned included resource constraints, inadequate training of healthcare providers, expectations of senior tri-services leadership to assume the role of a health care provider and remote operational locations, among others. It was expressed that treatment had to be both proactive and reactive in nature. Specifically mentioned was the potential to utilize innovative new technologies, such as internet-based cogitative behavioral therapy (ICBT). Participants were generally supportive of ICBT as a possible treatment option that could be accessible while maintaining privacy. Third, many expressed the importance of supporting reintegration back into the workforce. From an operational standpoint, public safety officers will likely be re-exposed to traumatic events once back to operational duties. To date, many expressed that little resources have been devoted to helping operational public safety officers reintegrate back into the workplace. Evidence-based research is required to ensure that the right steps and programs are being implemented when addressing all three areas. Many expressed that to ensure a holistic approach, resilience, treatment and integration should receive equal focus. It was noted that standalone initiatives such as an education awareness campaign itself could not fix the stigma. It was also cautioned that treatment for PTSD is underfunded and those that do seek treatment often face long wait times. Therefore investing simply in reducing stigma at the expense of treatment would compound the problem. Throughout discussions it became clear that participants viewed PTSD as a condition on a full spectrum of mental health needs, which should all be addressed. The last key theme that emerged throughout the roundtable was the need for evidence-based research. Given the scope of the problem and the amount of organizations affected, many view the existing research to be fragmented and poorly integrated into public safety organizations. Support was expressed for a single window to provide integrated cutting-edge research to public safety organizations across Canada and act as a coordinated research center for the governments of all levels to utilize. Many participants expressed the view that having a centralized area of expertise on PTSD research for public safety officers would better inform decision making at all levels. Participants specifically mentioned the need for research and expansion on ICBT and a longitudinal study with the Royal Canadian Mounted Police and others to help identify underlying causes of PTSD. Budget 2016 reaffirmed the Government's commitment of support and treatment for public safety officers suffering from PTSD. PS is working closely with federal departments, including the PS Portfolio, the Health Portfolio, Department of National Defense and Veterans Affairs Canada to develop options to meet the mandate commitment of the Minister of Public Safety and ensure a timely delivery of a national action plan on PTSD and other OSIs.